ENTIRE HOUSE WITH PRIVATE BACK YARD WITH MISTING SYSTEM AND POOL! Relax - Restore - Luxuriate in this 2,000 square foot home fully equipped for all your needs. 3 Bedrooms (1 King, 1 Double, 1 queen + 1 double futon) + living room W/Sofa, additional dining area, 1 dining room and 2 Bathrooms (1 with bathtub and 1 with STEAM SHOWER). Sleeps 8-10. The very private resort-style backyard and relaxing interior make this spacious 2000 sq. ft. home the perfect place for a relaxing vacation with family or friends. Recently installed patio misting system makes it possible to enjoy the outdoor area in the scorching summer months. NEWLY INSTALLED HEATED SWIMMING POOL for year round swimming! 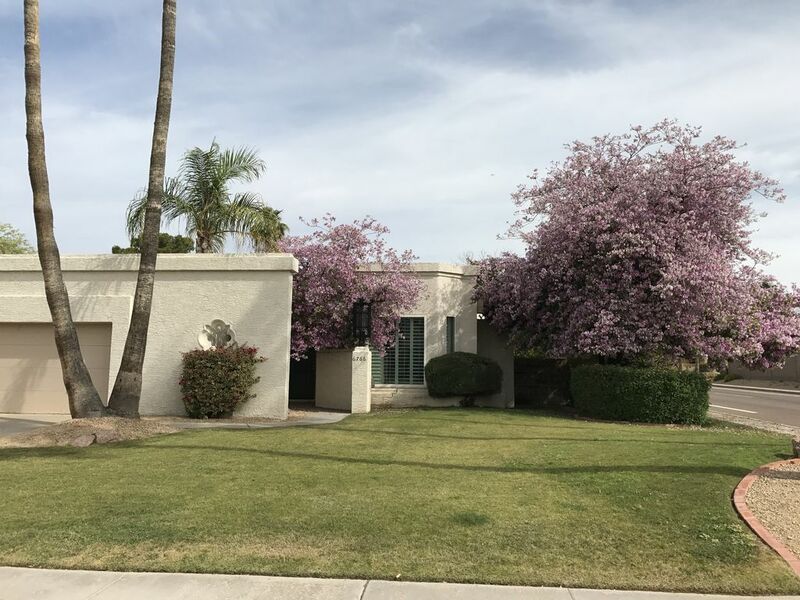 This 3 bedroom, 2 bath, single-level private home is located in a quiet residential neighborhood within walking distance of Kierland shopping mall, where you will find a wide range of restaurants and shopping. 5 minutes walking distance to the area's best golf courses. Nearby hiking, horseback riding, art galleries and movie theaters ensure you get the best of what Scottsdale has to offer . This elegant home features a private, resort-style backyard with a BBQ grill, ideal for relaxing and entertaining. Recently remodeled kitchen with stainless steel appliances and an eat-in breakfast area. Microwave, over/stove, coffee maker, nutribullet and all things necessary for cooking/baking and enjoying a real homestyle stay. For your dining pleasure, the dining room seats 6 overlooking the swimming pool. Additionally, the living room has a separate dining area which has an additional table that seats 4. Whether you are in search of entertainment or staying informed, there are 4 wall mounted flat screen TVs throughout the home. Regardless of whether you are lounging or eating, you will never miss what's happening in the world or your favorite TV show! One TV is in the dining room, 1 in the living room and 1 in the master bedroom and 1 on the 2nd bedroom. In addition to the TV, the master bedroom has a walk-in closet and access to the back yard. There is also spa-style travertine steam shower with Roman plaster walls. There is WiFi throughout the home and a bluetooth printer available. For your convenience, fresh towels and linen, blankets, conforters, pillows, glasses, cups, plates, silverware and pots and pans for home cooking are available. The ideal home away from home! Woof woof - we are very pet friendly (though the home is well maintained and always smells clean and fresh). ~ Kierland Commons and Scottsdale Quarter: 1.5 miles; 3 min. ~ The Westin Kierland Golf Resort & Spa: 1.5 miles; 3 min. ~ TPC Scottsdale Golf Course: 3 miles; 6 min. ~ CrackerJax (mini golf, go karts, driving range): 2.5 miles; 5 min. ~ Top Golf and Riverwalk Casino: 11 miles; 15 min. ~ Old Town Scottsdale: 11 miles; 20 min. ~ The Scottsdale Waterfront: 11 miles; 20 min. ~ Salt River Fields: Spring Training Home to AZ D'Backs & CO Rockies: 11 miles; 17 min. ~ Scottsdale Stadium: Spring Training Home to SF Giants: 15 miles; 21 min. ~ Sloan Park: Spring Training Home to Chicago Cubs: 18 miles; 23 min. ~ Desert Botanical Gardens: 19 miles; 29 min. ~ Cardinal Stadium; 20 miles 30 min. ~ Fiesta Bowl: 30 miles; 32 min. ~ Barrett-Jackson: 5 miles; 10 min. ~ Arabian Horse Show: 5 miles; 10 min. ~ The Phoenix Open (PGA Tour @ TPC Scottsdale w/the Famed 16th Hole): 3 miles; 6 min. ~ Spring Training: Home to several MLB teams including SF Giants, AZ D'Backs, Colorado Rockies, LA Dodgers and Chicago Cubs (and several other MLB Teams); Stadiums located throughout The Valley. ~ Phoenix Sky Harbor International: 20 miles; 26 min. ~ Scottsdale Airport: 2.5 miles; 5 min. Scottsdale is an unparalleled Vacation Destination! The city offers great weather, bars, restaurants, golf, shopping, and Major League Baseball's Spring Training as well as highly recognized annual events including Barrett-Jackson and The Phoenix Open. ALL LOCATED AT ONE DESTINATION! We purchased this home to escape our busy LA life, to relax and unwind in one of the most sought after areas in AZ with our amazing 4 legged friends. When we come to Kelton house, we always have a great time and leave feeling restored. Some of our best business is done while we relax poolside and we always leave wanting to stay longer. We want you to feel this way about Kelton House too! We want you to have fun and love every minute of your stay and to make our home your very own. Enjoy! The house was perfect for us. All on one level with plenty of space for six. The kids, three granddaughters, especially enjoyed the heated pool. Great location for sightseeing of Grand Canyon, Sedona, hiking on Bell Rock in Sedona and Camelback in Phoenix, visit Desert Botanical Garden, climb Hole in the Rock, and top it off with a mini family reunion at a niece's house on Moon Valley Country Club the last night in town. All in all, a great time was had by all. Great location close to all amenities. Quiet neighborhood. Home is very spacious and comfortable. Amazing steam room in the master on suite. Private backyard with heated pool and outdoor fireplace. ALL the comforts of home (plenty of towels, linens, etc). Owner very organized as we didn't have to purchase any paper products, cleaning supplies, etc. Stayed for five (5) nights. Owner checked in via text message to confirm we were enjoying our stay. Property is very well maintained with an inground sprinkler system that activates in the early morning and a landscaping crew that attends the premises to cut the grass, etc on a weekly basis. I wouldn't hesitate to recommend. Thank you for writing such a wonderful review. We are happy you enjoyed our home and would love to host you as a guest again! My husband and I lived (and worked remotely) in this home for two months. We had our small dog with us and occasional visitors. I would say the house comfortably sleeps 5 adults. If there are children you could fit another 2 - 3 people. The kitchen has basics for cooking and an assortment of glassware. The pool is large and the backyard is very comfortable and secure for people and dogs. Perfect for our family to gather here! It was clean and very homey feeling. We enjoyed the house very much. We cooked every meal there and felt like we had everything we needed. The backyard was perfect for the dogs-just enough room for them to get out and run around a little. The house was nice with a split floor plan and my parents enjoyed having their own access to the backyard. The weather was perfect as we went in December. The owners were very helpful and was always quick to respond via text or call. Thank you for the kind and thoughtful review. We are pleased you enjoyed Kelton House and welcome your return any time! We enjoyed ourselves and the kitchen and grills gave us opportunity to cook and eat in. Grocery store was 5 min away which was perfect! The pool was also a hit. If it could have been heated that could have been a plus but overall great house and would return! Thank you for your review. I am happy you enjoyed your stay. We are in the process of installing a pool heater and plan to have it up and running at the end of this year, useful if you do plan on visiting us again in the future. All the best. Very nice home in quiet neighborhood. We were very pleased with the home overall. The only drawback, was there is no sofa bed and the futon is very small. The home was nicer than we imagined and bigger than the pictures show. I would definitely stay at this place again, and highly recommend it to parties of 6 or less. Check in time is 3:00 p.m and check out time is 10:00 a.m. We book check in times as close to check out times as possible to enable our guests to enjoy the home for as long as possible during their stays. The cleaning crew is scheduled to arrive promptly at the check out time to get the home ready for the next guest. If you check out late it will affect the guest who is staying after you. Please be courteous. If you need to check in before 3:00 for any reason, please email us and we will happily try to accommodate you. It may be that we grant you access while the cleaner is there but we prefer to have the home ready for you in advance of your arrival.